-our trip to the EMKC Winter Show (http://www.kangeikoiclub.com/2012/03/kangei-koi-club-at-emkc-winter-show.html). Our web write up has pics of over 100 of the fish on show, and lots more general show pics as well. We'll start our meeting reflecting on those events, and flicking through the many photos. Gary Pritchard gave Kangei members a private tour of the vats at the winter show, sharing his knowledge and experience for over an hour and a half! I have the whole audio recorded with with video exerts from some of the vats which I'll play at our meeting so everyone can benefit from it. Everyone enjoyed it at the winter show and this is a second chance to hear some of it. We're getting closer to spring, and I noted a 20 degree swing in air temperature over 24 hours a few weeks ago. 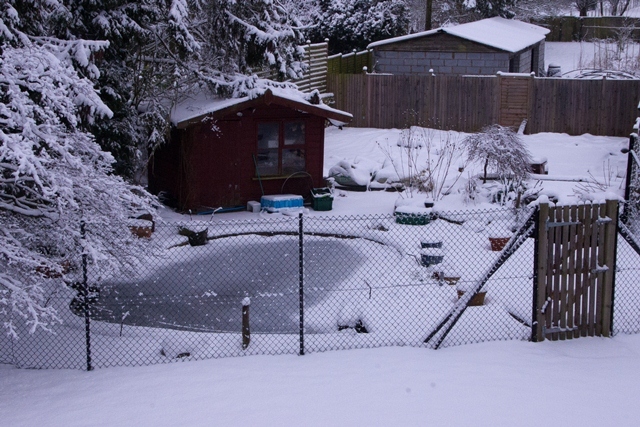 This is what my main pond looked like just a few weeks ago. At the AGM, I think it was Kevin who suggested we try a "round the room" review of how we're all getting on with our ponds and I thought we could give this idea an outing to help share our experience between members. I would also like us to consider our summer schedule, including pond visits, show visits, a photo show and I would like us to consider holding a Kangei summer garden party.